e-amusement (formerly eAMUSEMENT or e-AMUSEMENT) is an online service offered by KONAMI since August 30th, 2002 to enable certain games to access special locked content, as well as providing live Internet ranking. It is used by all current BEMANI games alongside other KONAMI arcade games. Initially, players had to use one Entry Card (エントリーカード) for each game and register it to a KONAMI ID. Its replacement, the e-amusement pass was introduced in November of 2005. Unlike the Entry Cards, one e-amusement pass can be used for more than one game. On November 17th, 2010, support for mobile and BitCash was added. The Asian e-amusement service undergoes maintenance every weekday morning from 5:00 to 7:00 JST. An extended maintenance period affecting all regions occurs every third Tuesday of the month from 2:00 to 7:00 JST. During this period, arcade games that run under the e-amusement service are still playable, any scores or progress made towards unlocks will not be saved. All e-amusement pages with the exception of the portal site are also temporarily taken down, rendering any customization options or score data that requires the web interface inaccessible. Any arcade games that are running in demo mode during this window will display a message stating that the network is under maintenance and e-amusement passes cannot be used. Register scores and records of compatible games. Unlock secret songs (on BEMANI games). Be notified of and access special events (eg. APPEND TRAVEL in jubeat copious APPEND or Café de Tran in jubeat saucer and beatmania IIDX 20 tricoro). Insert / Scan your card into the reader on the side. You will be shown the terms and conditions; select the agree option "はい". Input a 4-digit PIN. This is used to authenticate your card. Input it again to confirm. Enter your IIDX DJ name (up to 6 characters). Then select your region. As of beatmania IIDX 25 CANNON BALLERS, the USA (米国) entry has been changed to アメリカ (America). You will be asked to confirm your beatmania IIDX details. Scan your card on the reader next to the monitor, on the side, or below the monitor. You will be shown the terms and conditions, just like IIDX. Set a 4-digit pin to use as an authentication code. Repeat the same combination to confirm. Enter your DDR Dancer Name (8 characters) and then select your region/country. America has regions sorted by state. As of DanceDanceRevolution A, the USA (米国) entry has been changed to アメリカ (America). Your DDR Code and dancer information is now saved. Subsequently, simply insert or scan your card, enter your PIN, and register your card on that game (if you have not done so). To manage your e-amusement pass and access specific game features, you will need a Japanese KONAMI ID to login into the e-amusement homepage. Go to the e-amusement registration page. Fill in the areas with your info. Make sure both your ID and password are between 8 to 32 characters long. For security Q&A, you may need to enter the answer in full-width alphanumeric using a Japanese IME. Click the red button to continue and again on the confirmation page afterwards. A confirmation email will be sent to the email address entered. After confirmation, you can login from the e-amusement homepage by clicking on the red "ログイン" button and fill in your user details there. Many of the important e-amusement management and game pages can be accessed from the e-amusement tab of the e-amusement homepage. You will need to attach your e-amusement pass to your account before you can access game-specific features such as viewing DJ Data on the IIDX website. Click "KONAMI IDに新規登録する" from the e-amusement tabs on the left or click here. Enter your 16-digit e-amusement pass card number and your PIN. Check "PASELIを利用する" to allow the use of PASELI on this specific e-amusement pass. Click on the red "登録する" button to complete the attachment of your pass. Your pass is now linked to your account. Click "KONAMI IDから切り離す" from the e-amusement tabs on the left or click here. Click on the red "切り離し選択" button next to the e-amusement pass you wish to detach. The red box "参照中" next to the pass means it is currently set as the primary card. Your pass is now detached from your account. Click "参照中のe-AMUSEMENT PASSを切り替える" from the e-amusement tabs on the left or click here. Click on the red "切り替え選択" button next to the pass you wish to set as your new primary e-amusement pass. You must have at least two e-amusement passes attached to your account in order to switch passes. Your primary pass is now switched to your new pass. This feature is useful if you lose your current e-amusement pass and need to transfer onto a brand new pass. Keep in mind that you cannot transfer onto a pass that's already been attached to a KONAMI ID account or registered on an arcade machine beforehand. Click "データ引継ぎをする" from the e-amusement tabs on the left or click here. Enter the 16-digit card number of your new e-amusement pass. Click on the red "確認する" button to complete the transfer. Your data is now transferred onto your new pass. Click "暗証番号を変更する" from the e-amusement tabs on the left or click here. Enter your new PIN in both boxes. Click on the red "内容を変更する" button to confirm the PIN change. Your PIN is now changed to your new PIN. Click "PASELIチャージする / 利用履歴を確認する" from the e-amusement tabs on the left or click here. If you have a pre-paid 1000P PASELI card, click on the green button under PASELIカードでチャージする with the pictures of an example PASELI card. Click on the green button, select BitCash, and click on the green button again. Enter in the 16 hiragana BitCash code and click on the green button. Click once more to confirm the purchase. Your account now has a new PASELI balance. Click here and log in with your KONAMI ID. Select desired amount of PASELI available. Check the box at the next page to agree to Terms and Conditions, then input credit card information and click "Confirm". Review inputted information then select "Purchase". Your account now has new PASELI balance. Note: Some of the screenshots still reflect the PENDUAL website, though there's little difference between it and copula onwards in this regard. Feel free to upload updated screenshots under new names, however. Note: Any button that has a blue tab (instead of a yellow tab) on the left can only be entered if your account has a basic e-amusement subscription. Note: Any button that has a lime-green tab (instead of a yellow tab) on the left can only be entered if your account has a premium e-amusement subscription (after May 1st, 2016, available to Basic users until then). Click "プレーヤー検索" from the tabs on the left or click here. Search for your IIDX rival by entering the IIDX ID, DJ Name, or one of the four search options (Same Dan Rank, Same Shop, etc). Click on the name of the player you want to rival to bring up the player page. Click on "SPライバル" or "DPライバル". Set the tick from "NOT ACTIVE" to "ACTIVE" on SP and/or DP to set the player as your rival. The player is now set as your rival. You can confirm by checking your rivals list. You can also check for players currently rivaling you on the challengers list. Click "カスタマイズ" on the top or "クプロカスタマイズ" for the customize Q-pro page or click here. 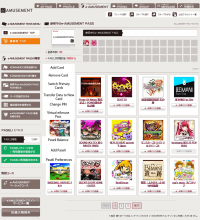 Click "プレーカスタマイズ" for the interface and category customize page or click here. You must have a basic e-amusement subscription to be able to change your interface and category customizations. Category customizations affect if category folders appear in music select (Ex: "DJ LEVEL" set to ON will show LEVEL 1 - 12 folders in music select). Frame customizations are not yet available for copula. Click "オカルト研究調合部屋" on the top for the shop page or click here. You must have a basic eAMUSMEMENT subscription to be able to purchase any interface customizations or PULACO tickets to unlock PENDUAL songs. This feature requires a premium e-amusement subscription to use. Click スコアデータCSVダウンロード in the DJ Data tab, or click here. Choose whether to download SP or DP data, then click the button. A text dump in CSV format will appear in a text box below, suitable for copy/pasting to your favorite spreadsheet program.